When chocolate and toasted marshmallows melt together between graham crackers, you have a delicious classic that�s frequently a favorite around the campfire�s�mores. Now, you don�t have to make a sticky mess or wait and wonder when to go camping simply to have a taste of that yummy snack. 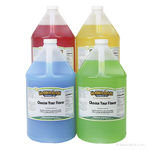 We have creatively crafted a s�mores flavored shaved ice and snow cone syrup, that has the true essence of the actual treat and blends together seamlessly with shaved ice. 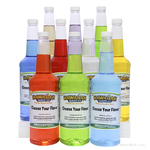 S�mores are popular amongst everyone from small children to grown adults, so this will be great for any occasion from sleepovers to dinner parties, and more. 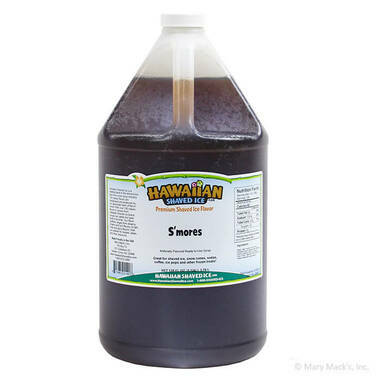 Add this gallon-sized container of authentic s�mores flavored shaved ice and snow cone syrup to your stock, and you will certainly have as much as you need, whenever you need it, even at a moment�s notice. 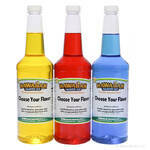 If you are looking for a smaller sample, this syrup is also available in quart size.